We do offer multiple pet discounts for pets staying together. Please check price page for details. 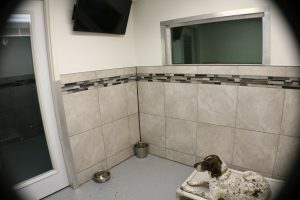 Our standard dog boarding areas are climate controlled both for heat and ac. They are 4 ft by 6 ft on the inside and have an additional outdoor space. 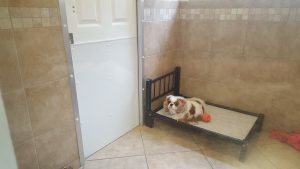 We provide a raised bed for each pet for their additional comfort. 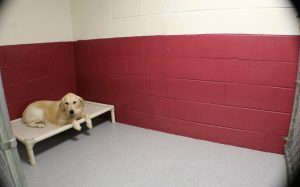 Our deluxe dog boarding areas are climate controlled both for heat and ac. They are double the size of our standards runs. 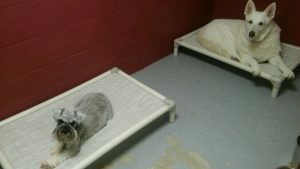 We provide a raised bed for each pet for their additional comfort. If you have a family of three dogs staying together you must choose this option. Our Small suites are climate controlled private rooms and are furnished with “home away from home” comforts including a small bed and a TV with a variety of channels. Our Large suites are climate controlled private rooms and are furnished with “home away from home” comforts including a large bed and a TV with a variety of channels. 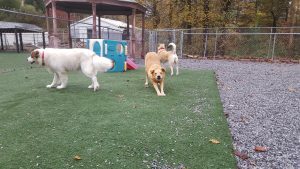 In addition to their accommodations each pet receives outside exercise time either in small groups or by themselves. 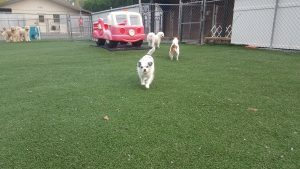 Our doggie playground is about 5000 sq feet of astro-turfed outdoor play area with gazebos for shade. We even have doggie pools in the summertime! We provide raised beds, stainless water pails and dishes, blankets, toys and dry food. Routine is the key to successful pet boarding and we try to match the routine you have at home as best we can. 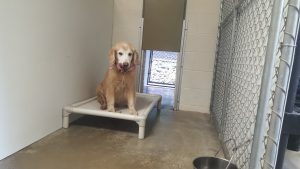 To that end, when packing we encourage you to bring your pets own food, medications, 1 bedding item and 2 toys per pet. Please limit the size of the bedding item, as we have to be able to sanitize it and if we cannot fit it in our washer, we will refuse it. 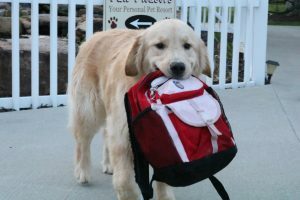 All dogs boarding with us must be current on their Rabies, Distemper and Bordatella vaccines and be on a flea and tick preventative. We must have proof of vaccines on file with us prior to your pets stay. All pets staying with us must be neutered. The kitty wing is a secluded area and has a full view of our reception. Each kitty receives their own condo with a hideaway area, a separate area for their litter pan and a shelf for those afternoon cat naps. 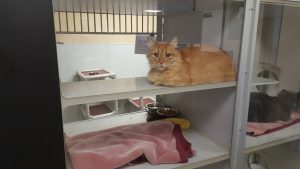 All cats are booked in individual condos but families can be connected upon request. 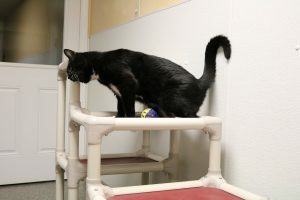 In addition to their own area each feline guests receives the opportunity to play in the spacious cat room where they can enjoy climbing on our cat tree. We provide cat litter, litter boxes, stainless food and water dishes, blankets. 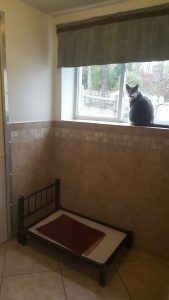 Routine is a key to successful pet boarding. We try to match the routine you have at home as best we can. 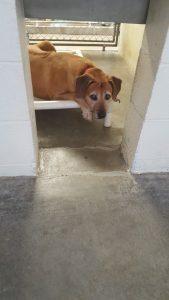 To that end we encourage you to bring your pets own food, medications, 1 bedding item (it will have a familiar scent to help them settle in) and 2 toys per pet. Please limit the size of the bedding item, as if we cannot wash it in our washer, we will refuse it. If your feline friend needs a little more space they can always book our small suite. The small suite is a private room, climate controlled, measures 5 ft by 6 ft and comes furnished with a bed and a TV with a variety of channels. This suite also features a window that provides natural light and a perch for your kitty to lounge on and enjoy the view of the outdoors. All cats boarding with us must be current on their Rabies and Distemper vaccines as well as be on a flea and tick preventative. We must have proof of vaccines on file prior to your pets stay. All pets staying with us must be neutered.